I found myself having to use my ring fingers on the pinky rests to help move the bellows in and out, put a lot of excessive wear and tear on my thumbs, and in general had a miserable time. So I started thinking about modifying the box somehow, but was unsure how to proceed and didn't want to open the box up just to look inside. However, after a couple days, my Jackie developed a rattle, which turned out to be one of the tiny nuts holding on one of the thumb straps, so I had to open the box up anyway to put it back. Once I had it open, I could see how the pinky rests were attacked so decided to move them while I was at it. 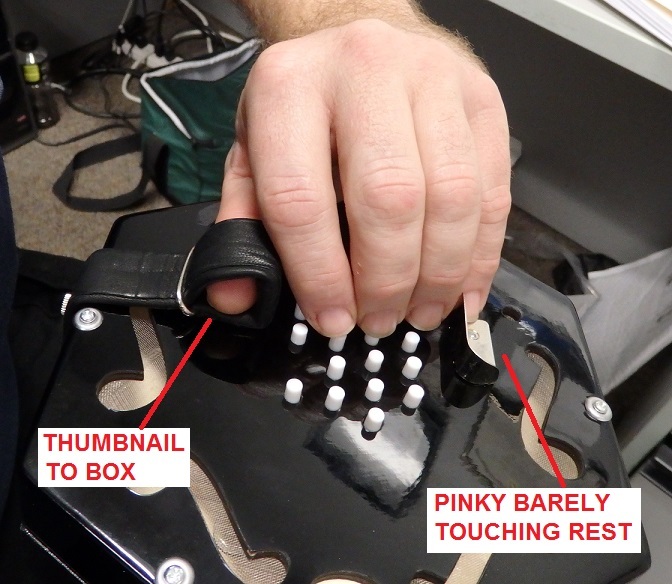 The pinky rests are normally held on by 2 screws. What I did was move them back so that now they're held on only by 1 screw, the former rear screw is now in the front hole of the rest. I also cocked the rests at an angle so they're parallel with a row of sound holes in the corner instead of leaving them parallel to the button rows. I put the unused screw back in its hole so it wouldn't get lost and also so as not to have an extra hole in the box. And I made sure all the strap and rest screws at both ends were well tightened so as not to have to open the box again. I'm VERY glad I made this change. It's seriously the difference between night and day. Now it's very easy and comfortable to play the box. So if you've got hands like mine, you might find this modification helpful. NOTE, however, that making the change requires taking the end cap off the reed/action pan. While that's easy enough, getting the cap back on over the buttons is much easier said than done. The buttons all have to be vertical to fit simultaneously through their holes in the end caps, and some of them have very small amounts of wiggle room before coming loose from their rocker arms. Thus, you'll probably spend a lot of time trying to get all the buttons back on their arms and pointed the right way. Fiddling with one will often make another come loose, and if they're not perfectly vertical, attempting to put the cap back on will also knock them loose. From your pictures it is clear that you only have your thumbs inserted the smallest distance in the straps. Now some advocate this and others like to push their thumbs right through so that the weight is taken on the second joint of the thumb. It is probable that hand size, and finger lengths, have an effect on the choice of thumb insertion. I chose the fully inserted thumb position many years ago , as I have medium broad hands and shorter fingers, and have been comfortable playing 56key instruments and utilising the whole range. I think the minimum thumb insertion might not suit your hand shape. In a recent ICA magazine there is a full page of photos taken at a recent workshop which illustrate the variety of finger positions used to hold an EC - which supports the hypothesis that different approaches work for different people and their hands. I have small-medium [male] hands with relatively long fingers. I tend to have my thumbs inserted into the thumb straps so that there is some grip/tightness around the first joint (perhaps a relic of initial learning the instrument and being terrified of dropping it). A couple of people have pointed out to me that my pinkie often only just sits at the end of the rest (similar to Bullethead's picture above) - this has never really caused me a problem and I hadn't previously been aware of it. As this post has made me think about it, I do find my Scates box with leather covered pinkie rest more comfortable to play than some heavier concertinas with bare metal rests which cut in a little after prolonged playing whilst standing. The modification above is interesting (and thought provoking) - does it make the concertina harder to hold when played standing? I have a sense it might 'droop' without the full ability to brace against the original line of the pinkie rest? I don't think anybody really has a choice of how much of their thumb is in the strap. To me, it appears that unless you change where the thumb strap is attached to the concertina, the amount of thumb inside the strap is dictated by the proportions of your hands and fingers. This is because you have to position the whole hand where your playing fingers can easily reach all the buttons with minimal movement of the wrist (just like with typing). 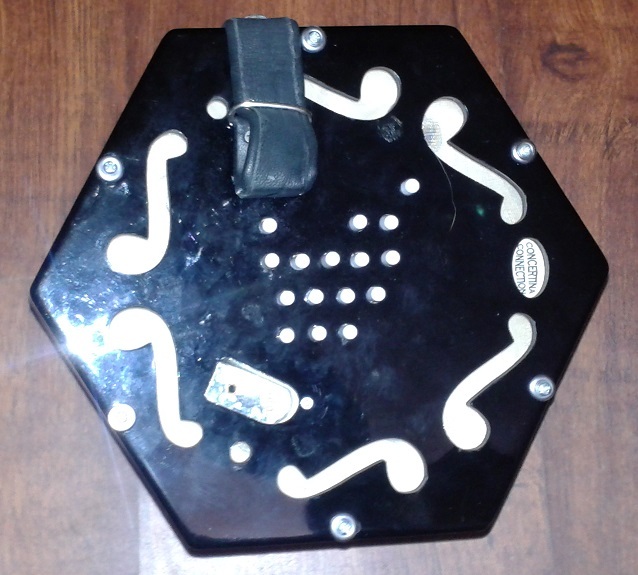 As you find this optimal playing position by sliding the hand forwards and backwards along the concertina, the thumb moves with the hand while the strap remains stationary. Thus, the overall hand position is determined by the needs of the fingers and the position of the thumb will fall where it may in relation to the strap. In my case, the palm of my hand is 10.5cm long but my middle finger is only 8cm, and when I lay my thumb along the edge of my hand (as if saluting), the very tip of my thumb doesn't quite come even with the basal joint of my middle finger. Thus, when my hands are positioned so I can easily play all the buttons, only the distal half of my thumb is in the strap. I have the straps as tight as they can go, wedge the thumb knuckle into the rear of the strap, and have about 0.5cm of the tip of my thumb protruding out the front of the strap. My picture of the original configuration in the 1st post was a bit contorted due to taking the picture myself. Thus, my thumb wasn't as far into the strap as it usually is. 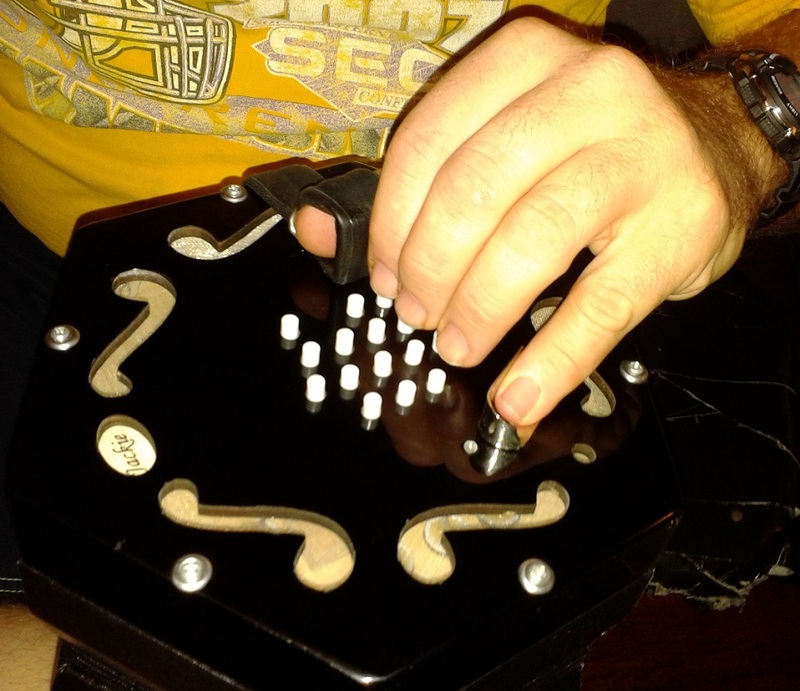 I've attached some new photos (which also show the modified position of the pinky rest) that are closer to my actual playing position (as modified by having the concertina vertical instead of horizontal). @Ardie sent me a PM pointing to a long-locked thread from 2003 where @goran rahm argues that standard position and design of the EC pinky rest is an historical artifact and was already considered obsolete by the 1860s. Thus, I feel no sense of sacrilege in moving the rest . As to ease of playing, I find this modification increases it greatly whether sitting or standing. What the modification does is to get my pinky involved in stabilizing the end of the box, especially when pulling the bellows. Before, my pinky had so little contact that when I pushed buttons while pulling the bellows, the ends of the box rotated due to the button pushes, resulting in incomplete button depression and gaspy, wheezy notes In addition, all the bellows force was on the thumbs and this pained them, and as my pinky struggled desperately to help, it caused much muscle fatigue in my forearms and tensed up my whole hand so the playing fingers weren't very nimble. In short, playing was both physically debilitating and musically bad. So it was either change something or abandon the instrument. Now that I've moved the pinky rest, all is good. My pinkies now easily provide proper support without any effort at all, just due to being in their natural position. As a result, moving the bellows is MUCH MUCH easier in both directions, I always get total button depression, and my hands are totally relaxed and my fingers as nimble on the EC as they are on my typewriter. And my ring fingers are now free to play the accidentals instead of having to help the pinkies hold the box. Observe the attached photos. Note, however, that my hold of the concertina depends on gravity, whether sitting or standing. When sitting, gravity holds the box on my knee so my hands can just move laterally. I as yet lack a shoulder harness (I've only been playing the EC about 2 weeks now) so when I stand up, I hold the concertina up at the level of my throat. hands pointing up, so that gravity holds it down on the tips of my thumbs and pinkies. So again, my hands only have to move laterally. I wouldn't hold the box down at my waist without a harness. Ok Bullethead.... everyone has to find their own happy position but I am trying to suggest that you might eventually find it more comfortable with a deeper inserted thumb. From reading your other post I see that you have been playing less than a month whereas I have been at it for 44 years. Your hand shape appears to be not that different to my own but what you are playing is a very truncated version of the EC keyboard.When you move onto a full sized keyboard your views may change. I've never felt the need to modify the EC holding equipment, perhaps I just started young enough or naive enough that I thought the instrument was 'correct' as recieved. Forty years later when I began to play Duet concertinas I did a fair bit of experimenting with handrail positions but still play EC's sans modification. I bow to your vast experience. I'll never live long enough to match your current total, let alone what you continue to accumulate . I'm not out to change the concertina world here. What works for me in my particular situation probably won't work for everybody because we're all different.and, as you say, the Jackie only has 30 buttons. If I ever get more buttons, that will also be a different situation and that will require its own solution, which is a problem for another day. As to modifying concertinas in general, I wouldn't do that with an antique. These are "living museum" pieces to be treated with reverence and awe to preserve their historical (not to mention resale) value. But I see anything newly made as fair game. Nobody cares about cheap entry-level things and my mod to my Jackie made no irreversible change to the instrument anyway. I can always put the rest back in its stock position. At worst, the paint on the end will get marks from where the rest is now. So that leaves new mid-range and top-end boxes, the prices of which are not insignificant. The way I see it, if I'm going to spend that kind of money, it had damn well better be a perfect fit for my hand, like a tailored pair of gloves. Without a total custom rearrangement of the guts to move buttons around, which would be ridiculously expensive, the only option is to move and/or redesign the straps and rests. I'd definitely do that if I ever buy such a box. And the result would have about zero resale value because it wouldn't fit anybody else, but I wouldn't plan on selling it anyway It would be strictly for my own use and enjoyment. I have a degree in industrial engineering, a fair part of which involves the ergonomics of highly repetitive finger movements. I've also been typing for over 40 years and learned on a manual typewriter. So far, I find both of these experiences highly applicable to the EC. And if the ergonomics of the hand wasn't an issue with playing concertinas, this forum wouldn't have a whole topic devoted to it. So while I don't have any noticeable concertina experience, I do have a lot of experience with hand ergonomics so can perhaps offer a fresh perspective and some general guidelines for those unfamiliar with this field. So for the EC (I no nothing of Anglos), from the general guideline perspective, the main threat is repetitive motion injury (RMI), which can take a number of forms because the hand and wrist have so many moving parts. Carpal tunnel syndrome (CTS) is one of the most familiar but there are many others. A lesser threat is muscle fatigue, which shortens the amount of time you can go without a break. But while some of this will naturally occur in beginners (at least if they don't type much) until they develop the muscles used in concertina play, it can also be a sign that your ergonomics are wrong, which means they're a warning of impending RMI. Therefore, the goal is to position the hand and use its parts in such ways as to avoid anything that might trigger RMI or cause muscle fatigue. This means keeping the wrist as straight as possible at all times, with the fingers arched and the wrist some distance off the surface of the box, as with a manual typewriter. With a manual typewriter, this posture evolved specifically to satisfy the 3 needs of speed and duration of work while avoiding RMI. This need for a straight wrist means that bellows must be moved by the elbows and shoulders as much as possible, although the push-pull notes of an Anglo might require more wrist involvement in certain passages (I've never played one so don't know). The entire hand must be relaxed to avoid fatigue and to allow the fingers to be as nimble as possible. The hand must be positioned so that the fingers can reach all their buttons with as little movement of the wrist or hand as a whole.as possible, which both reduces fatigue and RMI risk, and also gives higher finger speed. This hand position, which will vary with the proportions of the user's hands and fingers, determines where the thumb straps pinky rests must be. And these attachment points must be designed and positioned so that the thumb and pinky sit on them naturally, without need of muscle tensing (to avoid fatigue and keep the fingers nimble), yet firmly enough to work the bellows by action of the elbows and shoulders without putting strain on the wrist. If you can arrange all this, then you should be able to play the concertina at high speed for long periods of time without either fatigue or risk of RMI. This outcome seems to me a worthy goal. I found that, with my own set of hands, my Jackie violated nearly all of the above guidelines. Therefore, I applied my knowledge and experience of hand ergonomics and typing to move the rests. Now all the above guidelines are satisfied and I'm reaping the benefits. I can't say that the above applies at all to Anglos or anything else but an EC, nor do I think that my own solution to my own problems will be of any use to others. However, I can at least point out the basic principles of hand ergonomics and let others apply them to suit themselves, or not. That's all I was trying to do. To someone who plays Anglo, and has never ever held a standard ' English ' in his hand, the arrangement of thumb strap and pinkie rest has always appeared strange. Priority is obviously to have full, adjustable, comfortable control of the instrument with available access to all the buttons. Is it totally impossible to achieve this with well designed Anglo-style straps. ? Well, I've never held an Anglo, just seen them at a distance, so we're in the opposite ends of the same boat . I wasn't intending to bring Anglos into this discussion because not only am I ignorant of them, but they have a fundamentally different design philosophy. So I was trying to say I was only talking about ECs, but rereading my last post I can see how it can be confusing. I'll have to fix that. But anyway, while we're on the subject, it is interesting to compare the design philosophies of the "user interfaces" of Anglos and ECs. Ignore for the moment that Anglos have push-pull notes and just focus on the common user tasks of pushing buttons and working the bellows. An Anglo's buttons are arranged similarly to the keys of a piano (rows of buttons) while an EC is like an adding machine (columns of buttons). This requires fundamentally different hand/finger movements from their users when playing runs of notes up or down the scale. With an Anglo, all the different fingers are used in sequence, as with a piano. With an EC (in the key of Cmaj) the whole run is played by only the 1st and 2nd fingers "walking" up or down the columns of buttons. Because of this, the Anglo player's hand doesn't need to move much if at all relative to the end of the concertina. This enables a more complete separation of the playing and bellows/weight-supporting functions to different parts of the body, so that the digits only have to push buttons. This should promote hand relaxation and eliminate many sources of fatigue and RMI, although the Anglo player should still be concerned with minimizing wrist deflection as much as possible. All in all, however, the Anglo appears to have a very ergonomic design. OTOH, with an EC, the fingers have to reach further, especially as you increase the number of buttons, because adding range to the instrument makes the button columns longer. 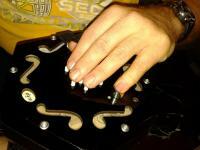 Because of this, and because people's fingers are only so long no matter who you are, the hand has to move somewhat forwards and backwards while playing. This is similar to how the hand must move a bit to type the numbers and bottom row of letters on a QWERTY keyboard, or when using the numeric keypad or an adding machine. This is no problem with typewriters and adding machines because those devices are sitting stationary on your desk. A concertina, however, is up in the air so while moving relative to the ends to reach the buttons, the hand also has to support the concertina plus work the bellows in and out. With an EC, therefore, the hand can't be solidly attached to the end as that would preclude the necessary fore-and-aft movement needed to reach all the buttons. This leaves no recourse other than to hang the concertina on 1 or more digits, at least the thumb and often the pinky, the joints of which provide the necessary flexibility in the attachment of user to box. This creates an ergonomic conflict within the hand because the thumb and usually the pinky have to be tensed at least a little to hold and manipulate the box itself while the other fingers must be relaxed to play with speed and accuracy. There's no way to eliminate this conflict completely due to the design philosophy of the EC keyboard; the best you can do is minimize it to a background level you can live with. And here, IMHO, is where the geometry of the individual user's hand comes into play. It could be that the standard arrangement of straps and rests suits you just fine. But if not, then you have a choice. Either suffer along with more fatigue, a higher risk of RMI, and lower physical limits on how well you can play, or modify the attachment points to reduce as much as possible the ergonomic conflict built-in to the EC. All that said, I really love the EC (at least now that I've tweaked it to suit my hands). Its design philosophy makes it very easy (for me) to learn compared to all other instruments I've tinkered with in my life (trumpet, trombone, guitar, violin, harmonica, bagpipes, piano). For some reason, its button arrangement just suits the way my Neanderthal brain works (especially the 1-tone-per-button thing---I like consistency ). And it excels at rapid runs of notes even for beginners, and is fully chromatic so can play in any key. All very good features IMHO. But all this comes at the price of some basic ergonomic problems that Anglos don't have. So IMHO there's ample justification to modify an EC to fit the user, should that be necessary for a given user. NOTE: I'm sure Anglo players can recite various other ergonomic problems with their boxes that aren't evident to me as a non-user. But they at least don't have the particular issue that ECs do (or at least not nearly as much). I find that my hands don't move , or by very little, when playing the EC unless there is a lot of work to do at either end of a four octave keyboard. Usually a little leaning back into the wrist straps of my Baritone/Treble is all I need for comfort at the lower end. The reason why an Anglo type strap and bar would not work for me is that my fingers will be active beneath my palms reaching under at an angle to press lower notes. I also find little need to rotate hands at the wrists. Many questions that people have when they commence a new instrument will be answered by time and familiarity. I have had some very long playing sessions, the longest I recall stretched for 14 hours of almost non stop music during a festival. More often I am playing in a dance band where hard playing of melody with chords (usually three or four notes at a time) can last for three hours . I often have sore fingertips from hammering the keys to produce rhythmic stresses, but never suffer with repetitive strain though my hands were tired after that 14 hour stint.